The AspectPT Philosophy for Discrete Manufacturing. Live scheduling, continuous automatic job monitoring, real-time machine connected, seamless ERP/Financials integration, leveraging mobile technology on the shop-floor, advanced support for manual work centres and assembly stations. …Visibility, Control, Continuous Improvement, Profitability, for Discrete Manufacturing. The modern factory is a complex, often chaotic environment. The need to integrate people, complicated machinery, raw materials, and customer demands to manufacture quality product to a deadline is challenging enough. Further, external competitive pressures and technological advances mean the business must run as efficiently as possible, and at the same time also turn a profit. AspectPL helps discrete manufacturers to turn this chaos into order. This is accomplished by providing a framework and systems for building a robust business, by removing manual processes and enabling the staff to concentrate on improving and optimising the plant. The AspectPT team developed the AspectPL software, owns the IP, and has a great deal of expertise in the ‘plastics & packaging’ sectors. As a local Australasian provider, we can make changes and enhancements quickly. 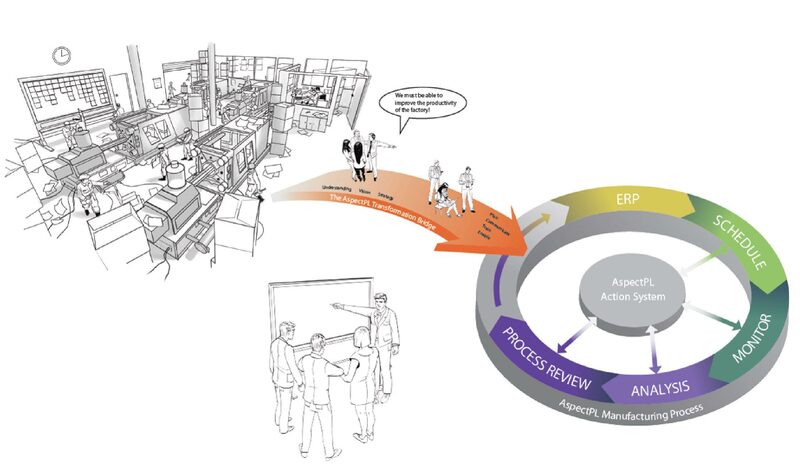 AspectPL supports and enables various OEE and Lean improvement initiatives. This leads directly to an improved bottom-line performance. Typically, AspectPL users report productivity improvements in the range of 10-15% within the first year which is easily maintained and then improved in the following years. Aspect Productivity Technology Ltd. was established in June 2009. APT has three major shareholders including ‘Evander Management Ltd’ the majority owners of Datacom, – New Zealand’s largest IT company with over 4,000 staff and $1B in revenue per annum. Based in Auckland, the AspectPT team is a solid team of experienced personnel able and willing to help any business reach their productivity and production targets and objectives.